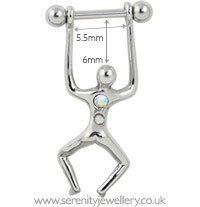 25mm long man ear shield with two crystals on his back hanging from a 316L surgical steel 8mm bar with 3mm screw-on ball closure. Please select the ear that the earring is for. So if you have your left ear pierced you'd need the left ear shield. I was desperately looking forward to receiving this. But (unless I did it completely wrong) I found it incredibly fiddly to put in/on. Then in my opinion it didn't sit right next to my ear, stuck out away from my ear. Perhaps the way my ears pierced or something but I won't be wearing it again, only wore to try on. Disappointed. Really cool, easy to put on, delivered quickly. 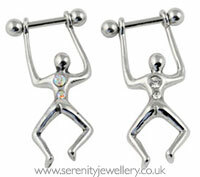 I absolutely love this piece of jewellery as the man looks fantastic climbing and dancing up the side of my ear! My piercings tend to be quite sensitive to a lot of jewellery and I have not had a single problem in this regard, it is light but solid, looking and feeling great. I only knocked one star off because the gems came out pretty quickly, but it still looks good without them.